Annalee Doll Description: Open eyes, closed mouth smile with tooth - as shown, white hair, gold halo, brown body, white gown, white wings with blue stenciling. This mouse goes perfect with the 2005 Mouse Nativity. 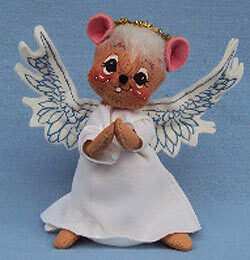 It is the only Angel Mouse that Annalee did with the brown body that was Made in the USA.